Fall is my favourite season! The colours, the cool crisp air and the beauty are so refreshing after a hot summer. Four blocks together make a leafy square. Sashing and a leafy border stitch into a delightful table topper. A paper- pieced Fall leaves table topper. inch block still speaks of Autumn. Leaves combined with a scarecrow become a warm welcome into my home. Playing Hide "n" Seek in The Pumpkin Patch becomes a favorite Autumn adventure! Thank you to Madam Sam at Sew We Quilt and to Cherry at Cherry Blossom's Quilting Studio for hosting Leafs Me Happy. For a full schedule visit Cherry and click the button in her sidebar. And a special thank you to Liz and Louise, my own personal computer tech people, who if you are seeing this post rescued me. Now is the time to head over to visit other leafy creations or as often happens when all the leaves are raked into a pile to dive in feet first as the neighborhood kids do. I love your work. The cat in the pumpkins is sweet! Thanks for sharing with us. Oooh these are all fabulous - I especially love the one with the cat peeking out from behind the pumpkin! Thanks for sharing. Oh such lovely blocks and inspiration. Yes, kittie in the pumpkin patch is a delight. Thank you for sharing with us today. You did loads. And it all looks amazing! Love the scarecrow. The maple leaf (the first one) is awesome. It reminds me of all those swoons I've been eying.....Well done! I absolutely love your cat and mouse! They are adorable. And your scarecrow is great! Thank you for sharing. Love your creations! 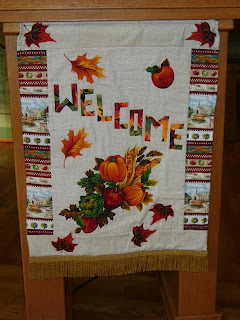 Great fabric choices and such a variety of beautiful Fall projects. Well done! Beautiful blocks and your verse at the top of your post is just perfect! All very pretty but I think the one with the scarecrow is my favorite. Great projects. That maple leaf is such a versatile block - love the topper that you made and the pumpkin with the cat is adorable. What fun projects you have done. The scarecrow just makes me smile! What a delight! Beautiful blocks and banner. I love the one with the black cat! Thanks for being part of the "Leafs me Happy" hop. Great Blocks. I do not have a favorite because I like them all. Thanks for sharing them with us. Wonderful blocks! I just love autumn leaves! Very pretty blocks, just love all of those fall colors. ANd the scarecrow made me smile. Love that hide and seek block...great projects, thanks for sharing!! Wonderful work! love the little cat at the pumpkin and the leafy table topper great as well. Fabulous projects.Beautiful fall fabrics choice.Thanks!! All of your projects are wonderful! I especially love the little scarecrow! Wonderful projects! I love your choise of colors. That scarecrow is just so darn cute and the black cat peeking around the pumpkin...well, I just love it and all your projects. Very nice! I really like all of your projects...but that scarecrow takes the cake!! Beautiful projects. I love all of the great fall "leafs"! Your blocks are adorable. 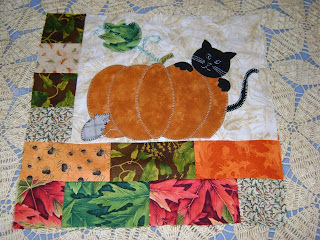 I love the scarecrow mini quilt and also the cat in the pumpkin. Thank you for sharing with us all. Very, very nice finished projects. Thanks for taking time to participate. You sure were busy with your gorgeous creations......thank you! Gorgeous blocks, Frances! I just love the colours of this season and your fabric choices combined with great designs really celebrate fall. Well done! All your blocks are wonderful! My favorite is the scarecrow, too cute. Thank you for sharing. 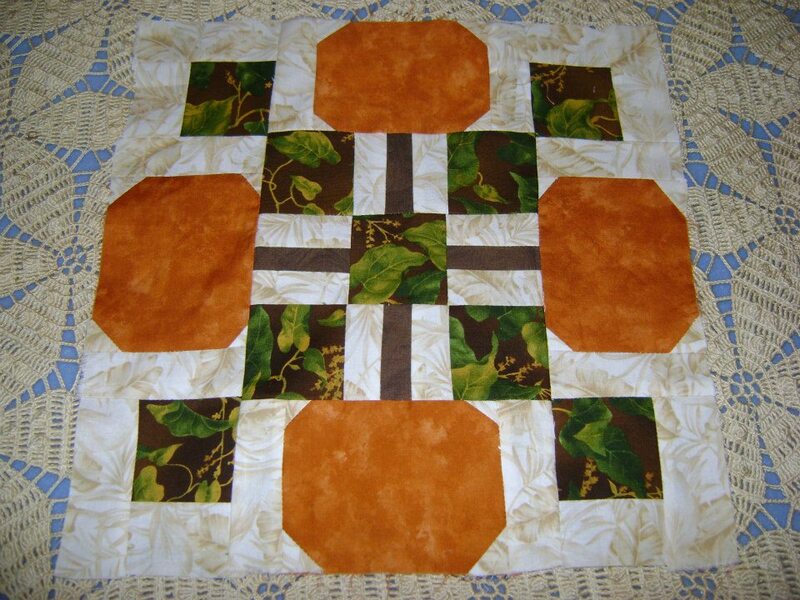 I love the quilt with the different leaves. Nice job. Adorable scarecrow, and the cat & pumpkin is precious. Thanks for sharing the link. Love the kitty and pumpkin! Your scarecrow is just to stinkin' cute to scare anyone. Thanks for the parade of pictures. Love all your leafy creations! Thanks a bunch for sharing your creativity! great leafy projects. thanks for sharing. What colorful and delightful blocks that you showed us. Each one is pretty in it's own right. Thank You for sharing your collection with us. Lots of fun projects. Both the scarecrow and the kitty one were my favorite. Gracias por compartir tantos trabajos bonitos. What great projects, thanks for sharing. Oh my gosh! Everything is so fun. I'm totally loving the scarecrow! Lots of hard work went into the making of this array. Love the little poem at the start. 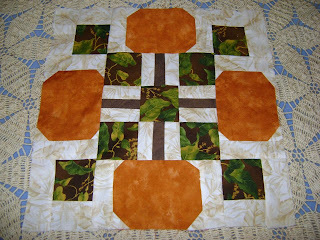 Great leaf mini quilts. Your scarecrow is sweet. My fave is the Hide and Seek in the pumpkin patch-cute kitty. Thanks for sharing. Lots of wonderful projects , thanks for sharing ! Fun Fall projects, thanks for sharing. Great work--and so many projects! How do you find the time to do all of this? Your projects are awesome! I love the cat peaking over the pumpkin! Thanks for participating & inspiring us today!! Excellent job there! Beautiful colors! Lots of pretty fall things "leafy" around your home. The kitten is adorable hiding in the pumpkin patch. Grand blocks - you were mighty busy! Loved your kitty in the pumpkin patch. Awesome works of art. Thanks for sharing! Your maple leaves are quite nice and you can`t beat the cat/pumpkin combination! Hi!!! Your blocks are wonderful!!! lovely quilting. thanks for sharing. I love your scarecrow! Thanks for sharing! Great blocks, especially love the kitty and mouse with pumpkin. All your projects look fantastic. Your house must look amazing with all those quilty decorations! Great blocks. I love the kitty and the pumpkin. I love your block!!! They are wonderful!!! All your projects look great. I especially love your scarecrow! Hiya! They're all so fantastic. I love the scarecrow, and the hide and seek game, and the maple leaves---I just love all of them!!! Thank you for sharing with us. Blessed be, hugs!!! Your projects look wonderful! I especially love Hide n Seek and the Scarecrow.